This is the most secure method to make payments for products or services online. Isle of Wight, Isle of Man, Scilly Isles, Scottish, Highlands, Scottish Islands, Northern Ireland. And batteries to these locations. You can track your order by clicking the "View order details" link on the listing that you're receiving. Please allow up to 24 hours for order processing. We work hard with all of our customers to ensure that they are getting an excellent shopping experience. We go one step further and offer a. Pre paid return label so its as easy as printing a label and dropping your parcel off at your local post office or convenience store. The Smart home era is coming, it's time to replace your old intercom! 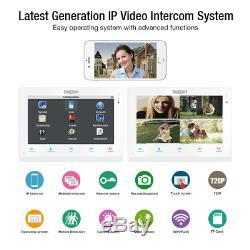 We recommend the latest generation Wifi IP Video Intercom System for you. Answer the door in your hand: Now you can see, hear and speak to anyone at your door, even remote unlock via your smartphone. You can speak to courier, you don't always go downstairs open the door. About the extension wire: The extension wires is not included in the box, but we will provide the 4 pin connector for you connect the extension wires. You can use RVV4/Cat5/Cat6/RG59 wires to extend the monitor to doorbell, or monitor to monitor according to your need, distance can be exceed more than 100M. Monitor Specifications: Display: 10 inch TFT LCD Touch Monitor Resolution: 1024(H)x768(V) System:LINUX Channel:4 channels Unlock: Monitor, smartphone and tablet unlock Additional Memory: SD card 128GB max. Network:WIFI/RJ45 port Power Supply:Built-in(AC 100240V), DC12V Multiple Intercom:Up to 4 monitors(The slave monitor is MZ-VDP-738EM) Multiple Doorbell:Up to 2 doorbells Ringtone:16 ringtones optional Made Of High Acrylic wire drawing panel and TFT display Installation: Surface mount(Wall mount) Doorbell Specifications: Camera sensor: 1/4 CMOS, 720P Pinhole/100? Wide angle camera Simple 4-wire connection IR LED illumination for better night vision Rainproof, Dustproof, and Anti-vandal Power Supply: Supplied from indoor monitor Package Included: 1x 10 inch Touch Screen Monitor 1x Doorbell 1x Power adapter 1x Mouse 5x 200mm 4 pin connector 1x Screw Bag 2x User Manual -? You can answer the door in your hand! Please note the wifi video intercom system does not mean you don't need wire any cables. 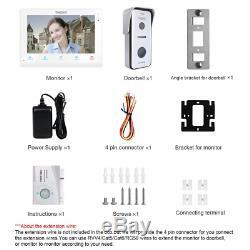 The monitor support WIFI network, but the indoor monitor and doorbell is Wired, which make sure the power, the video work stable and you can extend longer distance for your front door, garden and second floor. 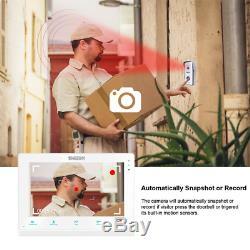 10 Inch Touch Monitor and 720P Outdoor Camera? 10 inch TFT display touch monitor with easy operating system and advanced functions, leading four-channels display. Wifi/RJ45 port connect to internet. (Only work with 2.4GHZ router band). 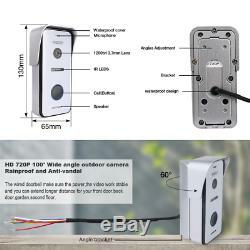 Outdoor doorbell with waterproof cover, built-in infrared sensor and 720P camera, 100? Wide view angle, Night vision, Rainproof, Dustproof, and Anti-vandal and can connect all the electronic lock. Multiple Intercom and Multi-device interconnection For 1-Family house? 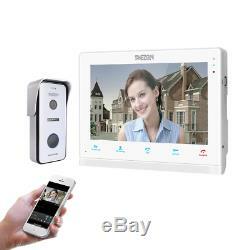 1x 10 inch IP monitor can connect more 3x 7 inch monitor and 2 doorbells. 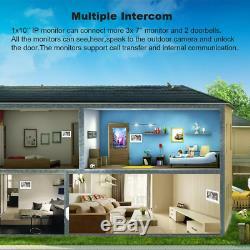 All the monitors can see, hear, speak to the outdoor camera and unlock the door. The monitors can call transfer and internal communication. Support connect additional 2x CCTV camera, 2x PIR alarms, 2x electronic locks, giving you more comprehensive protection for your home. We go one step further and offer a FREE pre paid return label so its as easy as printing a label and dropping your parcel off at your local post office or convenience store. The item "TMEZON Wireless Video Door Phone Doorbell Intercom System, 10 Inch Wifi Monitor" is in sale since Wednesday, December 19, 2018. This item is in the category "Home, Furniture & DIY\Home Security\Other Safety & Security". The seller is "eshop-5-uk" and is located in Tunbridge wells. This item can be shipped to United Kingdom, Antigua and barbuda, Austria, Belgium, Bulgaria, Croatia, Cyprus, Czech republic, Denmark, Estonia, Finland, France, Germany, Greece, Hungary, Ireland, Italy, Latvia, Lithuania, Luxembourg, Malta, Netherlands, Poland, Portugal, Romania, Slovakia, Slovenia, Spain, Sweden, Australia, United States, Canada, Brazil, Japan, New Zealand, China, Israel, Hong Kong, Norway, Indonesia, Malaysia, Mexico, Singapore, South Korea, Switzerland, Taiwan, Thailand, Bangladesh, Belize, Bermuda, Bolivia, Barbados, Brunei darussalam, Cayman islands, Dominica, Ecuador, Egypt, Guernsey, Gibraltar, Guadeloupe, Grenada, French guiana, Iceland, Jersey, Jordan, Cambodia, Saint kitts and nevis, Saint lucia, Liechtenstein, Sri lanka, Macao, Monaco, Maldives, Montserrat, Martinique, Nicaragua, Oman, Pakistan, Peru, Paraguay, Reunion, Turks and caicos islands, Aruba, Saudi arabia, South africa, United arab emirates, Ukraine, Chile.